Idle Prison Tycoon: Gold Miner Clicker is a new incremental game for mobile from the creators of Mega Shooter game. In the game, you run your own gold mine with the help of prisoners. Of course, you can buy diamond mine later once you have enough money. Prisoners in the mine work as a miner and dig for the gold. The game’s mechanics are quite simple and similar to other Idle games such as Idle Miner Tycoon, Kung-Fu-Clicker. If you are having problems understanding the game’s mechanics or looking for cheats, tips & strategies to earn more money, we are here to help you. In today’s post, we have covered everything about the game you need to know: Idle Prison Tycoon guide and Idle Prison Tycoon cheats, tips & strategies. Before we head to the main guide, tips, cheats & strategy part, let’s learn the basics first. In Idle Prison Tycoon game, you play as gold mine manager where you recruit the prisoners as the miners. All you have to do is collect the money, build & upgrade the cells to recruit more prisoners, earn money. But that’s not all actually. You will have to keep the mine safe as the monsters or spiders attack the cells after every few minutes. And when the attack is active, prisoners run away from the cell and become mad. They would not mine gold until you clear the spider web by tapping the cell. Another task is managing the guardians. You can assign one guardian to each cell to take care of prisoners. And the guardian also protects the cell from spiders. We will go deep into the guardian details in the guide part below. The game also features the prestige feature and it is named as city upgrade. When you use this feature, you get medals, but it will release all the prisoners from the cells. In short, you will start the game again with a few coins and without any cell. You can use these medals to upgrade the city. And when you upgrade the city, you get permanent buffs. For example; discount on upgrading cost, increase in online income, offline income, and more. So this is the basic Idle Prison Tycoon guide for the beginners. Let’s head to the main Idle Prison Tycoon guide and after it, read our top Idle Prison Tycoon tips, cheats & strategy. Each cell has some prisoners by default who work there for you and mine the gold. The gold production increases as you upgrade the cell. And as you upgrade the cells, the star-level of the cell will increase. Each star gives you a special boost. For example; increase in working speed. Additionally, you can assign managers or guardians to the cell for the security & caring purpose. As stated above, the role of a manager is to take care of prisoners and defend the cell from prisoners. The manager assigned to the cell makes the prisoner happy automatically over time even if you don’t serve the prisoner’s request by tapping the food icon. Sometimes, you get managers from the chest by getting the victory in the battles(defeat the spiders to get the victory). The main source of getting the manager in Idle Prison Tycoon game is through recruiting. On the main screen of the game, at the top-left corner, tap the profile avatar icon to head to the recruitment screen. There you can hire guardians or managers. The list gets updated after a few hours. If you are in hurry, you can skip or reduce the time by watching the short video ad. How To Level Up Guardians? The managers in the cell earn experience points when attacking the spider. The EXP is required to increase the guardians’ level. After the battle, you can see the changes. Tap the guardian icon and pay attention to the level bar. The green gauge in this bar gets increases as the manager gains EXP. When full, you will see the level up message just above the guardian’s head. Tap the manager to level up. This will increase the control and HP attributes of the manager. The HP of the manager determines how much damage he can take from the spiders. The control points determine the security/caring activity. Some Epic Managers come with special abilities. For example; Thunder is an epic manager/guardian in Idle Prison Tycoon game. His ability can increase the damage by 200%, cell’s revenue by 100%. Make sure to appoint these managers in the best cell. Go to the manager tab -> tap the manager icon -> just below the name of the manager, you can check its rarity; common, rare, epic. In Idle Prison Tycoon game, at the bottom of the screen, you can track the attack time. In due time, a group of spiders will visit the bottom cell and start the attack on prisoners as well as guardians. You must stop them. Tap the screen(in the cell where the group is raiding). Defeating the wave of the enemy will reward you a chest. From this chest, you could get cash, coins, managers or guardians. On the 5th day, a spider-boss will visit your cell. The boss’s power is very high as compared to its troops. Be ready; assign the managers, activate boosters or do everything to defeat the boss at all cost for a premium chest. Releasing the prisoner from all the cells will give you medals. Medals can be used in upgrading the city for permanent perks. But when you release the prisoners, you lose all the coins, cells, and prisoners(well, it’s obvious). But in return, you get medals. However, you will keep your cash, medals, and of course, managers. Upgrading the city is the only way to progress in Idle Prison Tycoon game. The reason is as you progress, the upgrade cost will go high, enemies will become stronger. By upgrading the city, you can increase the gold production, offline earnings, manager’s power, tap damager power, and much more. But to upgrade the city, you need medals. Read the Idle Prison Tycoon Prison-Release guide above for more details. So this is the Idle Prison Tycoon guide for the beginners. Let’s read our top Idle Prison Tycoon cheats, tips & strategies. Cash is one of the premium in-game currency in Idle Prison Tycoon game. You can use it to buy the chest in the treasure menu of the game. Yeah! You can also use it to get gold coins. But it would be a waste as coins can be obtained easily. But epic or rare manager cannot be obtained easily. So we would recommend you to save cash and buy the chest in exchange for cash(in-game currency). How to get? Go to the treasure tab -> scroll below to the cash shop section -> there would be the first option; watch the video ad to get free cash. You can accept this offer four times a day. In short, you can easily earn 40 cash/day+more cash by defeating the spiders. Every now and then, a bird appears on the screen. Tapping it will give you the ad offer. Make sure to accept this offer if you need. 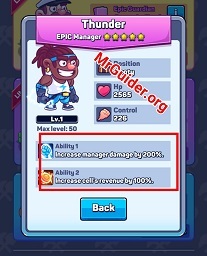 For example; some offers can increase the tap damage or manager’s damage in the spider-attack. Or sometimes, you get +40X coin production buff. On certain cell levels, you get stars. And these stars grant the special buff to the cell by increasing the working speed or other buffs. These levels are 100, 200, 300, and so on. So make sure to reach these buff level as soon as possible. Not all the cells produce gold at the same rate, in the same numbers. There is a huge difference in each cell production. And it is not impacted by the level of the cell, it is impacted by the cell number. For example; Cell 2 is better than Cell 1. Cell 9 is better than Cell 8. The list goes on in descending order. So we would recommend you to focus on the high-number cell rather than upgrading the low-number cell fully. If you want to upgrade the city, then make sure to release the prisoners. It will give you the medals. But make sure to release at the right time. The number of medals you get using this feature depends on current progress(total prisoners, prison time). And you should pay attention to the cost of city upgrades too. For example; the cost of an upgrade is 1.5K, then don’t release until the number of medals reaches this milestone. By serving the prisoner’s request(tap the food icon, drink icon to complete the prisoner’s request), you can increase the happy bar’s gauge. When its gauge reaches the maximum level, you will be able to activate the happy bonus booster to speed-up the gold mining.